If Dylan wanted to back him up, he must’ve been a hell of a leader. On mountains, he was. 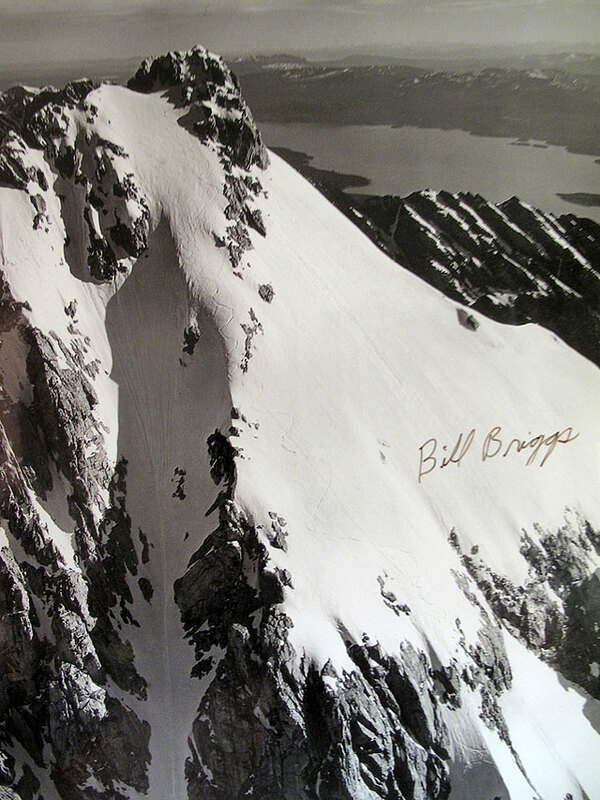 Notice mountaineer Bills Briggs’ ski tracks zig-zagging down from the summit of The Grand Teton, an unprecedented feat he accomplished on June 15, 1971, a few years before I climbed with him. Photo courtesy of Virginia Huidekoper. 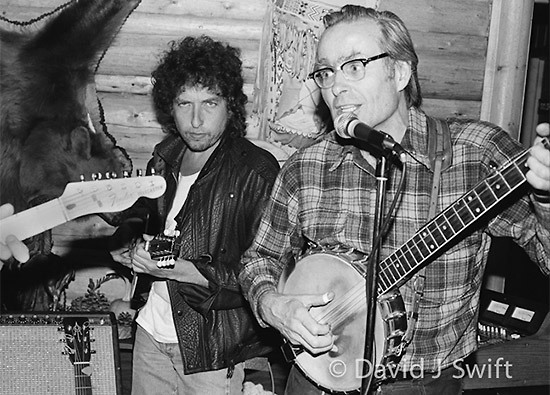 Do I start by saying that Bob Dylan once backed up Bill Briggs on mandolin — at a wedding reception performance — while Bill sang and played banjo? Ah, that’s a story for the other side of the summit. Bill Briggs seemed like pretty much a regular guy, at first glance. But he held a coiled, panther-like tension in him, ready to spring. 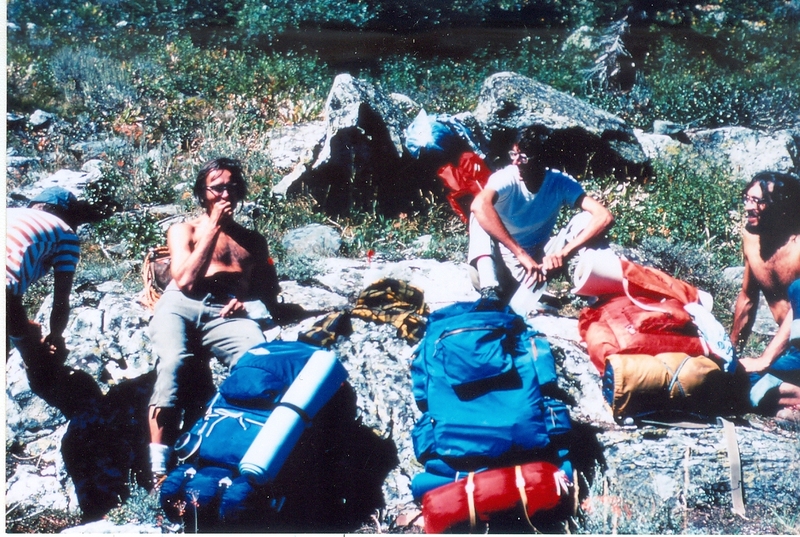 I picked up on this gradually as he gathered the party of climbers he would lead up Mount Moran in the Tetons in late August of 1976. He was the oldest guide I’ve ever climbed with in the Tetons but none of them ever had this type of veiled energy. I mean what other dude was crazy enough to do what he did on The Grand Teton, which serious climbers considered the American Eiger back in the ’70s. 1 Aside from the great mountain faces in Yosemite, it remains perhaps the most iconic mountain in the continental US, among climbing challenges. Go ahead, climb The Grand — I mean with skis on you back. When you reached the summit put the skis on…. Nobody had ever come close to flirting with that as a dream that I know of. It took slightly geeky, bespectacled but sinewy Briggs. But wait, there he stood with a physical disability, of sorts. But that’s as far as I take the “crazy” talk because he proved this seemingly unimaginable feat wasn’t impossible. I saw no trace of craziness in the man, just a barely contained creative energy. In retrospect I see this manifests itself in how a person finds an outlet, because creativity is a strange force when you think about it, like a slightly untamed spirit within that prods, fires and even directs the imagination. It whispers in the ear and the sound is surprising but oddly familiar. The first thing is to understand the improbable things he accomplished before we or anyone else imagined anyone possibly could. In that sense, he may be a role model I hadn’t thought about for a while until a few summers ago, for some reason. I didn’t realize until recently that 2010 marked the 40th anniversary of his devil may care plunge down the Grand. When I failed to track Bill down I despaired of ever seeing that image again so it wouldn’t be me making up a tall one. Of course Googling him never occurred then — cuz I was caught in a 1976 time warp, and snail mail seemed the only way. I contacted his former employer, Exum Guide Service in Jackson. No dice…. I knew he’d been the first and only man to have skied down the precipitous peak of the mighty Grand Teton, and here he was leading me on a climbing excursion. And it was partly a certain awe with the idea of climbing with this guy, who amounts to a pioneer in mountaineering and what today is called extreme sports. Despite his focused professionalism, Briggs relaxed when we made bivouac the first night of the climb. 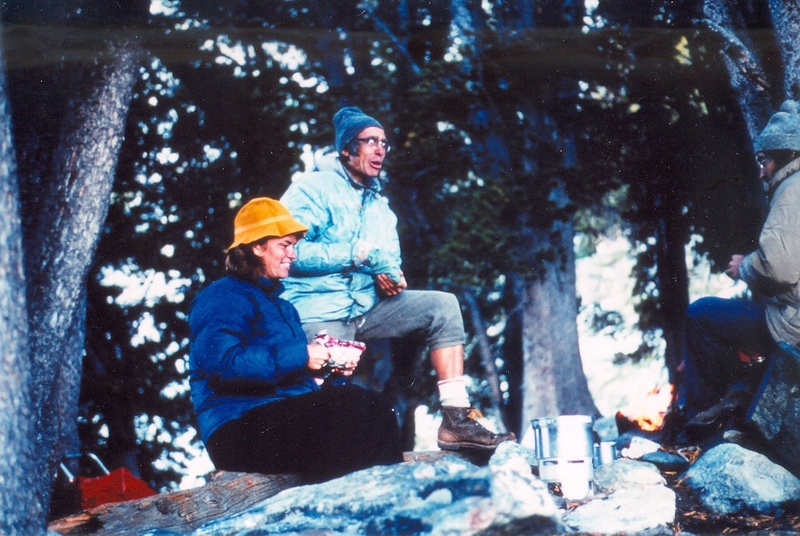 As we had our dinner meal, he was hardly shy about sharing his knowledge and wisdom, as is evident in the photograph of him holding court at that bivouac with Sharon and me listening raptly. I don’t remember a lot of specifics about what he said, because it was so long ago. I felt intrigued but I had not yet developed the reporter skills I would later in the decade that would lead me to a career in journalism. So I took no notes and did not press him about his most famous feat which I figured he was tired of repeating. I really don’t think I realized at that time that he had pulled off that remarkable accomplishment just a few years earlier in June 1971. But I have vague recollections of him speaking about various climbing exploits and about the challenge ahead of climbing Moran. I think I would’ve remembered if he had talked about his love for music and playing the banjo. Despite being by far the oldest person in the in the party, he did most of the rowing across the large lake most of the rolling cross the lake though Sharon pitched in too (No I didn’t feel like a Sultan, perhaps I should’ve.) . As Briggs rowed a long, dank lock of dark hair kept falling over his face and I also noticed a faintly maniacal gleam in his eye. Just his way of concentrating, I thought to myself. And yet now recalling him sustain that demeanor — and now knowing that he is a sort of Americana type singer and string player — he strikingly resembles the brilliant and certifiably eccentric North Carolina singer-songwriter guitarist Malcolm Holcombe, who has the same type of wandering hair lock. Jackson Lake is the largest glacial Lake in the Teton Range and the second-largest natural lake in Wyoming. Once traversed we also had to cross the immense Moran Canyon to reach the foot of our destined climb. Briggs had explained to us the length of this long approach and we understood that he knew the importance of timing the climb. So we didn’t want to distract him from keeping the proper pace. He explains in his interview with — that more difficult than his spectacularly daring downhill ski of the Grand Teton was getting the timing right — so that the conditions were perfect to make a survivable ski attempt. That same sense of precise purpose was at work as we approached Moran. After all he had our lives in his hands. Moran is a moderately difficult climb I had progressed to that level of difficulty in this my fourth summer of climbing in the Tetons, and third as an Exum-trained climber. 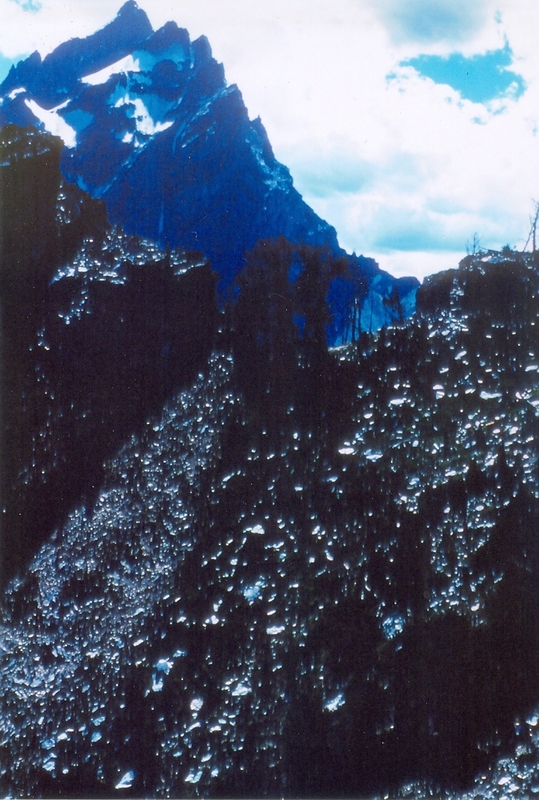 Nevertheless, Morton Moran (12,594 feet) has no easy route to its summit, according to the Bonney guide. As we scrambled up Mount Moran’s foothills, we encountered this view of the site of our guide’s extraordinary skiing feat, a few years earlier. The Grand Teton is the highest peak in the photo. Teewinot Mountain is the broad-faced peak hugging up against The Grand (and often confused for it). Perhaps the spirits of thousands of long gone prehistoric hunters have something to do with that haunting echo. Briggs, perhaps by training, steered us clear of the macabre site. Another part of the aura of the Tetons is an extraordinary weather changes, In the picture below, notice how Briggs (left) and I lunched in stripped-down garb. At the bivouac that evening (see first color picture, above) we huddle in our down jackets. 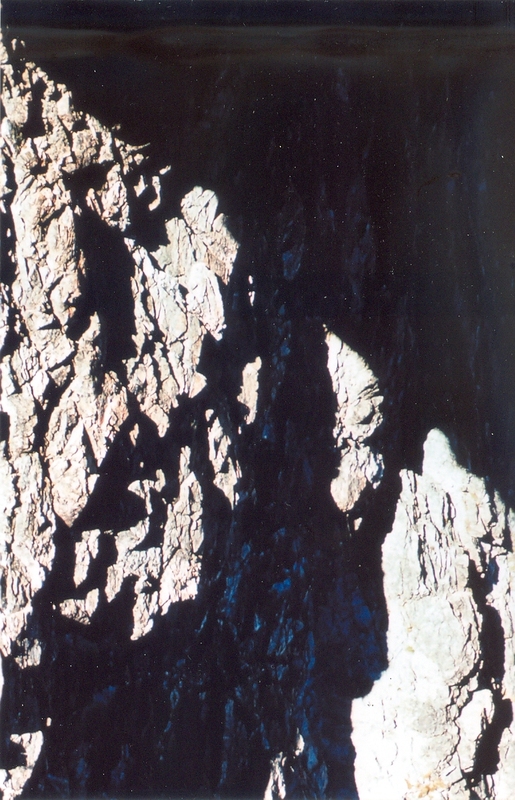 The biggest drama of the climb is the sheer exposure of a long pitch shortly after the descent from the summit. it’s in the negative 90° realm with some distinct overhang drops. As the light begins to fade over the Teton range, we got a view of how threatening Mount Moran can be, especially for a failing airplane, like the one that crashed here in 1950. But we were all securely belayed so it was just what I call a phenomenological thrill because once we got full awareness of her situation the new we were safe. 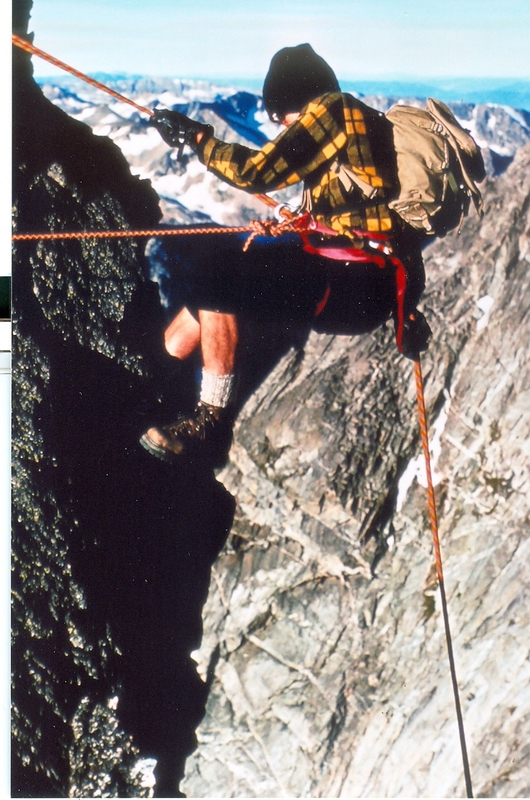 You can also judge the pitch from my photo of Richard rappelling. Banjoist, singer and mountaineer Bill Briggs accompanied by a hobo from Hibbing, Minnesota on mandolin. Courtesy of David J. Swift. 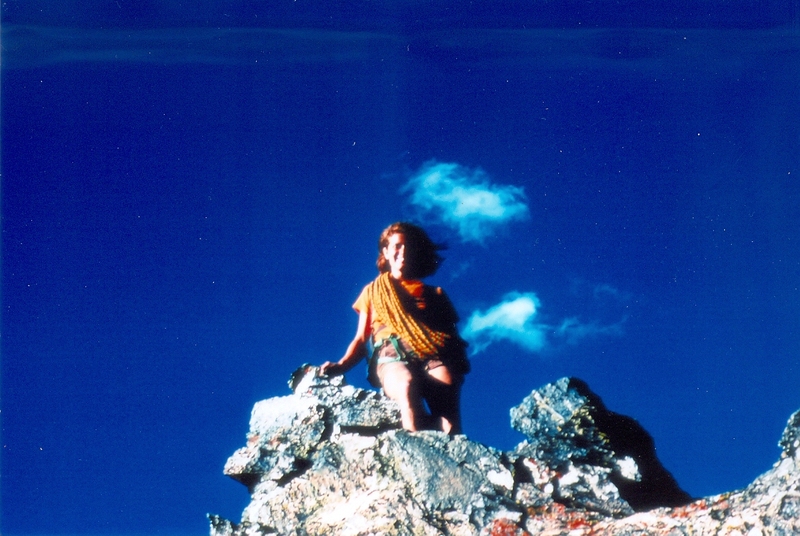 I’d struck up enough of an acquaintanceship with Sharon Salveter that she invited me to (chastely) share a cabin she had rented for the night after climb. We recollected our experience of Moran and Briggs. We perused the poster size photograph of Briggs’ remarkable skiing feat, which he had autographed for me. Then Sharon settled in for a sound and well-earned night’s rest. As for me, I struggled to sleep, despite the rigors of the climb. Years later, I carelessly lost the precious poster during one of my residence moves. But the image remained etched in my memory until I happily came across it on the Web, as you see above. Crane your neck and imagine being local newspaper reporter Virginia Huidekoper when she took that shot of Bill’s ski tracks. That wedding gig was one of Dylan’s brushes with greatness. * Salveter would go on to earn a PhD. in computer science at the University of Wisconsin — Madison. She is now a senior lecturer in computer science at the University of Chicago. 1. See Climbing in North America Chris Jones, University of California Press, 1976, 314. Briggs musician anecdote (special thanks to my sister Nancy Aldrich, who gifted me the Jones book for Christmas 1976). Both use unforgettable similes. One paints a somber picture of social realism, the other a more abstract, acidic challenge to a complicated and conflicted middle class. 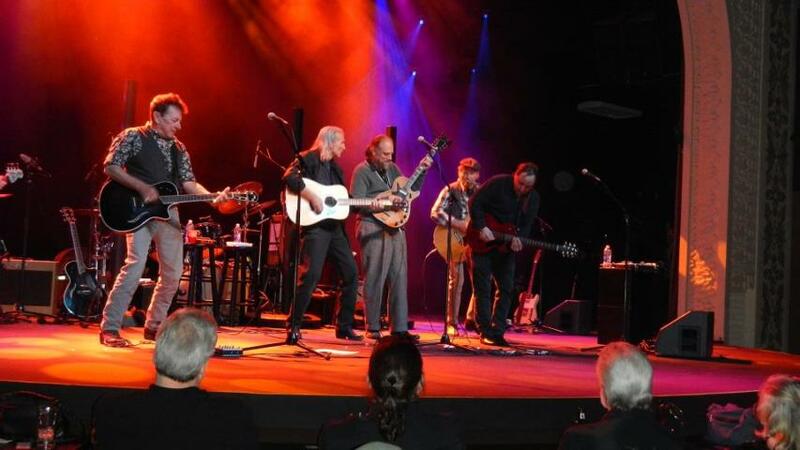 Placed together, they form a clearer picture of their times, and when unassuming troubadours like Briggs made a precarious living guiding middle-class guys like me up mountains. What of less-gifted hobos? What changed between 1963 and ’65? How does it feel, today? Does anybody sing a hobo’s song? All photos of the Mount Moran climb are by Kevin Lynch. I believe the photos which include me are by Sharon Salveter, but your blogger’s failing, middle-aged memory can’t be sure. How can the government be everywhere stealing our guns, Senator Lee? While Senate majority leader Harry Reid is beginning to exhibit a sliver of backbone on the issue of legislation to control gun violence, the gang of opponents to any organized safety against further tragedy is bending over backwards with agonizingly contorted rhetorical arguments. 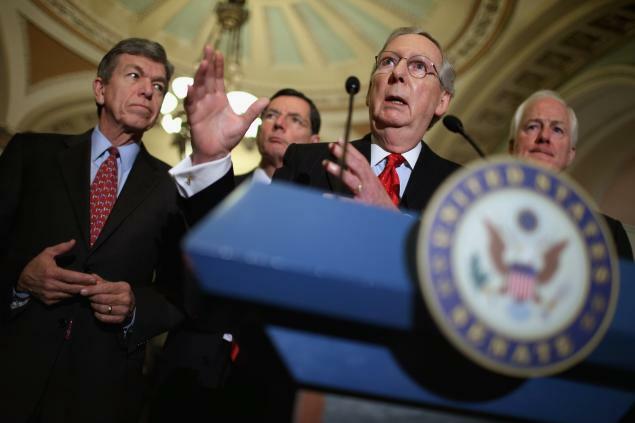 Reid hardly matches President Obama’s leadership and eloquence on the subject. But he gets to the procedural crux. Does Lee realize that he contradicts himself and his position with this broad, abstract fantasy argument, which completely ignores the cruel, heart-breaking reality of little kids getting massacred with military-style assault weapons that have no use in society except to kill people? Plus the Democrats have given up on banning such weapons already, and are only going for a universal background check on gun purchases. But to Lee’s tautological argument: if a government cannot be “in all places at all times,” how could it physically oppress its citizenry throughout 50 states, to where the people need to take up arms to fight for their freedom? And how likely is it that legislators elected by the people would ever condone a dictatorial, genocide-threatening oppression of their constituents? I suppose the paranoia fantasy would imagine a government coup of itself, but such anti-democratic contortions are unimaginable in any Democratic, or even Republican, administration. Both parties are just too bound by cozily self-serving convention and the status quo to do anything so radical. Even if we humor Lee’s improbable horror scenario, how long would it take before a group of miscellaneously armed homeowners are subdued by a battalion of highly trained Marines? Back in the real world, how many deadly rapid-fire killing guns does Lee want in the hands of criminals and mentally unstable people, which background checks would safeguard us against, and which virtually all law enforcement officials support? Rarely have elected officials, such as the filibuster-threatening senators, ever exhibited more pathetic and cowardly antidemocratic behavior. They’re afraid of even a debate on this urgent issue, perhaps because they know they will lose it. Because it is what the people (or 91% at last count) want, the same people he pretends to protect with the Second Amendment, which seems increasingly as antiquated as the muskets used by the colonists who wrote it. 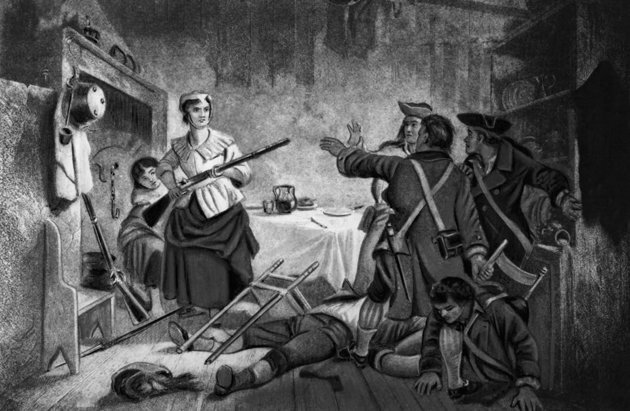 As my friend Anna Hahm recently commented, if we restricted ourselves to ancient, rusty muskets, allowing the NRA its slobbering gun-lust might not be too scary. It’s as if the ghosts of the Vietnam Veterans Memorial wall had emerged and began testifying with the simple eloquence of each of their names, spoken one after another. But this is the freshly dead — to put the cold, hard and slightly grisly truth on it. Although the horrific Sandy Town massacre is the soul and the basis of this recent movement t for legislation and accountability in gun safety — these voices will be reviving the names of the 3,000 people who have already been killed by guns in America since time massacre. For as long as Republicans filibuster against a vote on the new gun laws, the Newtown families plan to recite outside of Congress the names of Americans dead since then. It looks like an irrefutable trump card of unblinking truth and collective honesty.This will be for the profound, tragic and harrowing way pointed drama that we are almost turning our blind eye by not knowing how many people are dying after week after week to God because we have such lax gun laws as if we don’t care about all those people, dying and dying. And families and loved ones are grieving and grieving. Are we grieving with them? Do we care enough to do something about it? An Episcopalian priest named Malcolm Boyd was bold enough in the “do-your-thing” 60s to rhetorically asked the question, ‘”Are you running with me, Jesus?” * He became for a while what we would be now call a rock star of down to earth theology, or more precisely “Jesusology” because he never prayed directly to God personally. He admitted that like all of us he was a sinner and self-centered. He explained his title by saying it was the best way he had to understand the potential power that Jesus had to offer. He even intimated at times struggling with faith. Any doubter or nonbeliever in Jesus as a spiritual leader could ask this same question. Call Jesus’s bluff. Where would Christ stand on gun violence today? I think we have our answer already assuming Americans are fundamentally good people in the sense of justice and fairness. There’s one only answer to a just, fair response to what families of Sandy Hook are looking for as proper action. 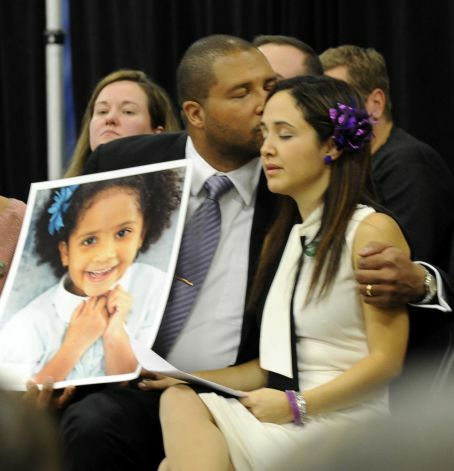 It is a call for responsibility over the vindication of their deaths appropriately and legally, and the assurance that an incident like Sandy Hook will never ever happen again. You can be sure that Boyd would be on the side of human life, would be on the side acting about of human life being wasted in the backdrop of an almost complicit negligence in our gun regulations or lack thereof. Boyd’s remarkable 1965 book Are You Running with Me, Jesus? was actually a bestseller because of his ingenious and forthright way of presenting prayers as often quite personal anecdotes, that addressed important issues of the day — human freedom, freedom from censorship, prayers for sexual freedom (you get that he was a liberal), “meditations on the cross” etc. The book came down inevitably to the final prayer act, which now implicitly calls for a new first act. That was his final prayer about dying. He pointed that prayers can be found in such unlikely writing as that of Samuel Beckett, Ingmar Bergman, Ralph Ellison, James Baldwin, Saul Bellow, Tennessee Williams, Michelangelo Antonioni, Jean Genet, John Updike and (pre “Saved”) Bob Dylan. Boyd never expressed belief in “God the father.” He did believe in Jesus as somebody very worth praying to. Just as people like to pray a favorite saints. The very act, the ritual is a cleansing action in part of the process of relieving grief. And by it’s very nature it gives us hope of being answered because we never know how it might be answered. When something good happens, prayers with no vindictive intent or lobby don’t hurt. They might help if for no and the reason than by virtue of the demonstrable philosophical and moral excellence of the very act of such a prayer, and these families’ spiritual presence as the embodiment of spirits who, in some sense, can be brought back to life. I heard today about Larry’s death, Jesus are for first reaction was sentenced because such an honest man and good friend was gone from the scene, Lord. I’ll miss. It seemed to be yours when out of his way to do the best he could about people and things. He made an effort to find out the truth and in spare himself in the process. He took an unpopular stand police called for at and never seem to court and easy sham popularity. It was a loyal friend but also an honest one in offering direct criticism, even when it hurt to give and receive it. The families of the Newtown massacre will be in Washington outside the Congress being the names of those died since their families and loved ones had. They are here at the invitation of Pres. Obama who, after making his speech in Connecticutt, invited them back on Air Force One jet to directly and simply lobby the Congress in their upcoming vote which the repose for public filibuster threatens to stop from every been happening. And note the names added at the bottom of Republicans who are signed up to be part of this filibuster effort it in C timelessness because it has no intellectual argument of substance against Internet universal background checks. They will be doing what they did a week ago in Connecticut simply reading the arriving legislators and handing them a letter and pictures of their dead loved ones in meeting face-to-face. 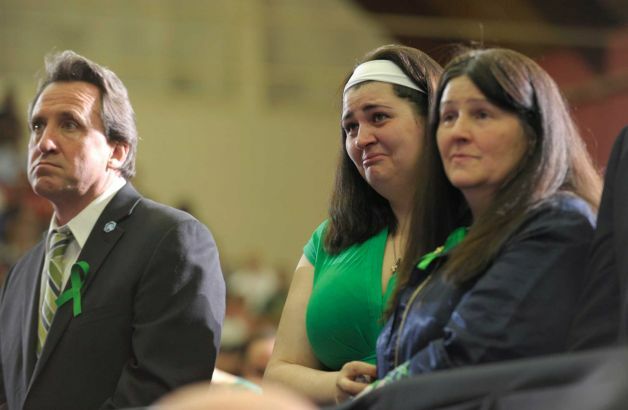 The strategy was so powerful and effective that Connecticut passed all of its gun regulation loss the first big step in this new effort certainly in terms of mirroring the steps that are being asked for at the national level. So they are the defying he values of the people and our current civil culture which increasingly senses that people like the NRA leaders hide behind aspects of the second amendment that are matters of historical obsolescence. It strikes me that passing his gun laws may feel like a great cathartic collective prayer for humanity. Who can argue against that is a spiritual gesture? Are you running with us, are you running with America, representatives and senators? *Boyd was an Episcopalian priest after his successful career in advertising and television. (One wonders if “Mad Man” Don Draper might end up this way. Boyd’s book cover photo has some of Draper’s haunted aura.) The New York Times referred to Boyd as “Chaplain at large US university students” and former Chaplain at Colorado State and Wayne state University and an activist for cultural and racial unity also a regular film reviewer and playwright. 2 Malcolm Boyd, “On Dying” from Are You Running with Me, Jesus? Prayers by Malcolm Boyd, Holt Rinehart Winston, 1965, 117. The Flatlanders head for the hills, or was it for a sure-bet payday? The Flatlanders/Jimmie Vaughn and theTilt-a-Whirl Band in concert, Northern Lights Theater. The Flatlanders seem to embody the restless and intricate cultural development called roots music. When they performed last night at Potowatomie Casino in Milwaukee, you could immediately sense the communal and, in this case fraternal, motivation at work. They’re surely brothers in Lone Star spirit, if not blood, having all been born in dusty West Texas as they retell it. Retelling is the essence of their art. Joe Ely, Jimmie Dale Gilmore and Butch Hancock are first and foremost gifted storytellers who pour memories and consciousness into their musical ingots with all the fire and color of Now Again, arguably their best album, with its cover photo of lightning in a blazing curve of synchronization with a rainbow, over a deathly flat-line Texas plain littered with an abandoned hay thresher and tractor tires. We’ve seen plenty of “super groups” in pop music come and go. Among American vernaculars, the most notable was The Highwaymen, but two of them, Johnny Cash and Waylon Jennings, are no longer with us. Another trio of great Texas songwriters — Townes Van Zandt, Guy Clark and Steve Earle — was documented together on one recording Live at the Bluebird Café, but that was never a formal group. As their name suggests, the lower-lying Flatlanders dwell a notch below The Highwaymen in the pantheon of roots music glory, but maybe that’s why they’ve survived, unlike hard-livers like Cash and Jennings (or Van Zandt). And Friday they carried no great pretenses about their legacy-in-progress, yet they know it’s rich with meaning. For that matter, they weren’t even the headliners — that honor went to fellow Texas bluesman Jimmie Vaughan and his Tilt-a-Whirl Band. That may be because Vaughn’s buzzing brand of electrified blues fit the mood of a casino better. 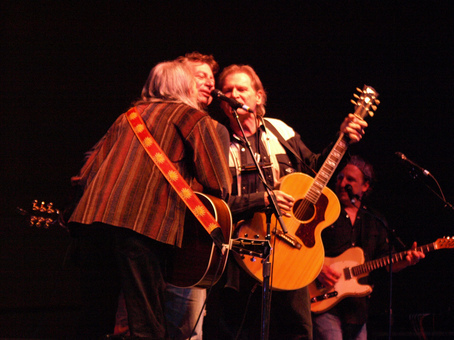 Early in the concert, Joe Ely commented that in “The Flatlander tradition” they’d just released a new album that was recorded, um, in 1972 – and which they’d plumb forgotten about. The Odessa Tapes were recently discovered by an archivist. There’s the somewhat myth-busting nature of the band’s history, in which a fine idea of an actual working band was hardly ever realized in the early years. As many roots music fans know, they led their own groups or solo projects, as suggested in the self-deprecating title of their extremely belated debut album More a Legend than Band, also recorded in ’72. And yet there’s a sense of history in that title, of course. So the trio of Texas troubadours tells personal, cowboy-colored tales but also trace details of the atmosphere and the landscape of those expansive yet stiflingly arid vistas. A prime example is Jimmie Dale Gilmore’s “Dallas,” one of their actual hit singles from the debut album. It’s just as telling how radically the group has retooled a song that originally emerged as a ballad. After Gilmore offer the opening verse in a reflective vein, Ely raised his arm and commanded the band to kick it off. Suddenly “Dallas” morphed into a bucking stallion, as the supersonic rush of a DC-9 refocuses upon the power and high of flying in a big airplane. That doesn’t distract the narrator from his wry observations, which turn “Dallas” into (danger: mixed metaphors dead ahead) the rich man with a death wish in his eye, and the woman who’ll walk on you when you’re down. Nevertheless, I would’ve loved to have heard “South Wind of Summer,” which closes Now Again, perhaps the group’s most beautiful shared impression of nature and humanity and our relation to it: “When the south wind of summer sings through the trees/and the high mountain thunder hangs low in the breeze. The song’s finely wrought internal rhyming echoes the strength of its shapely architecture like a range of majestic mountains, which I suspect every flatlander yearns to saddle up a horse and head off for. It’s a bit like Townes Van Zandt’s songs about the Colorado Rockies, which were actually his second home. But roots music is about understanding the value and meaning of the place you come from. And for the mountain of talent these three men represent, they still know their fraternal roots and actually ended their encore with a Van Zandt song, which is almost becoming a fashionable thing to do. “White Freightliner Blues” was surely written as a love-hate ode to that songwriter’s troubled relationship with cocaine. These friends of the late Van Zandt, who died at age 51, understand that well — even if they’ve never been hooked on the stuff. Because there is something about listening to those big wheels whine, out on the highway. That keeps them on the road. I’m glad the road’s never been too steep for The Flatlanders to periodically gas up and go when the spirit, and perhaps a payday, moves them. So it was off to the big Northern Lights casino, a sure-bet payday if they’ve ever seen one. Blues guitar slinger Jimmie Vaughan, not incidentally is very worth checking out. This is sort of another fraternal story, another tragic one, of actual blood brothers. Jimmie’s brother Stevie Ray Vaughn is long gone, his story has been told many times. That may be one reason why Jimmie has had enough and didn’t even refer his bro, though he did offer up a cover of Stevie Ray’s signature “Texas Flood” without mentioning its source, a gesture eloquent in its reticence. He probably processes his grief and whatever feelings that surely linger for his brother through his own powerful style, a greasy lowdown and horn-rippling roadhouse of blues. His veteran singing compadre Sue Anne Barton came out to belt a few and “kiss hips” with the main man. Vaughn, whose throaty singing style somewhat recalls the late Paul Butterfield, deals his loaded deck mainly from his white Fender Telecaster, which he even pulled back behind his head for a show-stopping solo. Man, what do they put in the water down there in Texas? I gotta get me some of that. A bit like the Wizard of Oz, avuncular Paul Geremia toils in obscurity, as if behind a curtain while mustering his musical wonders. This remains true despite some critics asserting that he’s as good as anyone playing country blues. He dwells in the murky corners of the blues history he sheds light on. 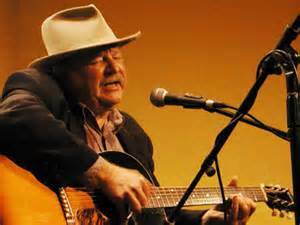 It was surely a stroke of genius for Geremia to dredge “Rising River Blues” out of 1920s obscurity because it’s a marvelous blues song and he performs it like a birthright, from wellsprings of his being. them runnin’ sweet mama like they haven’t done before. these rising river blues sho’ make me, sho’ troublin’ me. I ain’t allowed on the streets. These rising river blues sho’ make me be. Come here sweet mama let me speak my mind. Lose these blues gonna take a long long time. Who knows what had happened to Carter. Was he trying to placate a woman filled with fury after he’d betrayed her? Or must we consider a mere accident, the rising river itself, a flood? A rising river is a beautiful, or dirty, grave reaching out to pull you in. The lyrics suggest an inscrutable, existential, even ontological threat (the blues “sho make me be”), social and likely racist ostracism, a need for love or companionship that he may not be getting, and ever-lurking forces of nature — circumstances that all intertwine in this poor man’s life in ways that he can’t sort out. Facing the uncertain endlessness of the song’s final line, one can only wonder how long he can hold out. In the original recording, Carter falls into a wordless vocal chorus that sends him to unfathomable realms of the soul. * The abject mood of the song parallels Robert Johnson’s most low-down reveries. There’s the ravaged texture of Johnson’s intersecting soul, voice and guitar at the bedeviled crossroads. And yet there’s something softer in Carter’s song than Johnson’s most famous tortured railings and exorcisms, which indicates that the singer might be contemplating suicide. “If the river was whiskey I would down and jump,” another blues song goes. But this singer doesn’t care whether it’s whiskey or not. It’s hard to miss the vulnerability and weariness in Geremia’s voice, perhaps an offering of tenderness in the face of possible rejection. So the troubled aura may be akin to say Johnson’s lament, “Love in Vain,” made famous by the Rolling Stones. And Geremia makes this his story, in how the harmonica orchestrates the scenario as a mottled, lacerated backdrop. His high voice keeps slipping down, even as it struggles to remain above psychic water. In place of Carter’s wordless chorus Geremia interjects the harp’s moans. The total effect of his one-man-band is a stunning tonal range — his plangent voice, the 12-string guitar’s glimmering radiance evoking the river’s dappled light and energy, and the harmonica’s furry, burry depths — give his interpretation an almost cinematic dimension. Geremia stretches the song out to twice the length of Carter’s original recording. He understands this is a deep, long current worthy of riding. Geremia is also an extraordinary blues picker, as this song showed as did his rendering of a couple of Robert Johnson tunes in which he unleashed his bottleneck slide technique where the intensity shot up like brutally stinging vipers lashed from the guitar. He also did superb justice to Skip James and other blues greats and offered a rambling but endearing anecdote about visiting Leadbelly’s grave somewhere in Texas. You sense that this man’s search for truth leads him to the dustiest byways and the highways. Yet one wonders how much public awareness of this gifted man has to do with cultural conditioning and image. Though he dresses in working-class garb topped by a stylish hat, his portly, mustachioed presence might recall the rotund banker in the board game Monopoly more than an emaciated old black blues man. The latter, far more romantic image of the blues troubadour, may be something Paul Geremia simply can’t live up to, by accident of genetics. In this case, a stout, aging white guy might just be getting a slightly raw deal. Geremia presses on, despite that negative reality and yet he seems vigilant regarding the shallow money trench and the rising river that might pull him down, especially if he succumbs to the temptation of slipping into that trench. As long as he keeps floating and landing on the shores of another small club or a fan’s house (as in the video) we should be thankful. In this instance we can thank UW-Milwaukee, which sponsored him and perhaps helped to draw a crowd that was that easily twice as large as the one that saw him in Madison a few years ago. Finger-style guitar historian John Stropes is a local cultural mover and shaker who teaches a class in his specialty at UWM and he’s helped secure university funding for the MKE Unplugged series. So artists like Geremia need to persevere and find the dribs and drabs of paydays where ever they may lie. The real payoff is for the audience.